All Scottish Blackfaces are horned, with black or black and white face and legs and long white wool. The breed has been described as of "fierce and hardy look", and that description still applies today. Almost nothing can tame their independent spirit which is what makes them the Premier Hill Breed. 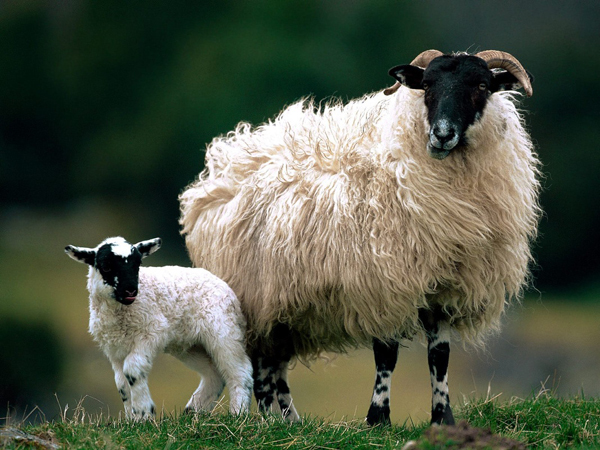 The Scottish Blackface ewe has a long life and typically will give four or five lamb crops on the hill or marginal ground and a further two or three crops on the lower ground. The small hill lamb is perhaps the finest gourmet quality, giving a carcass free from superfluous fat and waste, and fits very well into the burgeoning ethnic market. As a hill breed, Scottish Blackface lambs naturally mature later in the season and retain their flavor and succulence well into the New Year. Scottish Blackface rams are surprisingly mellow with impressive horns that develop their full curl by the second year of age. The pure white fleece should be free of black fiber and can vary from short, fine wool used for carpets and tweeds to strong coarse wool, which is sold mainly for the mattress trade. The white wool takes color dye very well. Head - To be carried above shoulder level, medium size, broad between the eyes, head and crown to be covered with short glossy hair. Horns - To start flat away from the crown with skin and hair between the roots, to be of medium thickness, should not turn too quickly, but sweep back, down and out leaving a good space between horns and jaw. To be free from blueness or any edge. Eyes - Bright, alert and full but not protuberant. Ears - Medium length and thickness, slightly curved, free from wool and long hair, alert and silky, never thick, fleshy or drooping, preferably carried behind the horns. Face - To be slightly roman, medium length with strong jaws, free from flesh, to portray sinew and muscle. To be covered with short glossy hair, colors to be distinct and not running together, pure black or black and white. Muzzle - To be strong and square; large, black, open nostrils, black lips with short broad teeth meeting the upper pad squarely, neither top nor bottom jaw protruding. Neck - Medium length slightly crested, strong and muscular. Shoulders - Slightly above the level of the back, not too broad at the top, with downward and outward sweep. Chest - Broad, but not too deep or carried too far forward, not too prominent. Back - Straight and level, well-sprung deep ribs, to have a nice kindly touch when handled, with the backbone well covered. Tailhead - Must not droop, to be almost square, wide, and giving an appearance of strength. Tail - Set in almost level with the back, should finish at the hocks, be well covered with white wool all the way down, should not swing when walking. Thighs - Should be very well developed and carried down, portraying great strength and power, and it should be kept in mind the "leg of mutton" is the most important selling part of the carcass. Legs - Medium length and size of bone, free from flesh below the thigh, giving the appearance of muscle and sinew, with a tight form skin, the bone to be flat and strongly jointed, legs set well apart with good clean hocks, slightly wider than the feet, with no tendency to looseness, giving the sheep a first-class carriage to enable it to travel long distances in search of food. The hind legs to come out well behind, never underneath, ensuring a long step and power to travel through rough ground and snow. Below knee and hock to be clear of wool and covered with good short hair. Pasterns to be springy to assist in climbing but not too long, with a sound, open, moderately sized foot. Color of legs similar to face. Underline - Weight should not be carried forward as in lowland sheep, underline to rise slightly towards the fore-end giving a picture of a great strength behind, should not be over-wooled below. Fleece - Must give protection without hindering movement, should be thick with medium staple, straight wool, a coarse outer coat and softer, shorter inner coat. There should be no hair, or blue or black fibers in the fleece.